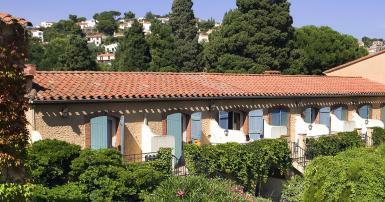 Le Mas des Citronniers has kept all the character and warmth of a grand family mansion with its own individual decor. Situated just a stone's throw from Collioure market, it is the perfect base from which to explore the delights of this wonderful region. We have 30 comfortable rooms, some of which are suitable for families of up to four people. Those in the garden have their own terrace. For older children and adults, an extra bed costs 20 euros per person per night (no food included). The number of extra beds or cots is limited to one per room. Please request more information on +33 (0)468 515454. A stablishment correct in service and personal. Beautiful catalan masia and good situation in Colliure. Great friendly Hotel in a fabulous position. The room was clean and spacious. Helpful reception staff and good breakfast. Avis laissé le 15 2018 par J. T.
Bonjour, We loved our stay at your hotel, the room we had was perfect with the small terrace which was shady and lovely in the heat of the day, also lovely in the evening. The staff were very helpful and provided very promptly an electric jug and cups for our room, beach towels, and an iron when requested. We would stay here again and hope to return one day. Au revoir. Avis laissé le 10 2018 par Hans H. B. C.
We were very satisfied with our stay and your service. Avis laissé le 10 2018 par Val P.
Awesome staff, so friendly, professional and eager to satisfy our needs and requests. We much appreciated. My room has had wifi connectivity issues for the duration of my stay and that’s the only reason i gave it a 4. However staff was very responsive and helpful. Would strongly recommend! Great location in the middle of everything and yet quiet!